Owing to the pharmaceutical industry requiring gentle pumping solutions, pumps solutions supplier Verder Pumps South Africa emphasises the importance of the standard peristaltic pump for the pharmaceutical industry. Verder International has proven success in the pharmaceutical market and has led to Verder South Africa to confidently entering the South African market. Verder consists of Verder Pumps and Verder Scientific, both well known in to the pharmaceutical industry, with Verder Scientific being represented by Monitor and Control Laboratories in South Africa. The pump manufacturing company, Verder Pumps, distributes Verderflex’s Vantage 3000 and Vantage 5000 ranges of standard peristaltic tube pumps that offer precision pumping and dispensing solutions for the pharmaceutical industry as well as the well-known hygienic pump brand, Packo Pumps. 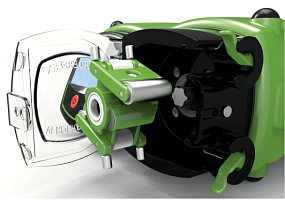 Verder Pumps SA marketing manager Elaine van der Westhuizen notes that these pumps also meet the stringent hygienic requirement of the industry with specialised casing to avoid leaks and cross contamination. The pumps are versatile, automatic units with sophisticated dosing programs, she points out. The applications are ideal for small-scale production and can be remotely controlled by external sensors for feedback control. The Verderflex dosing pumps have a quick tube changeover, which is useful when dispensing a range of different chemicals or dosing different batch sizes. The pumps’ casings meet the Ingress Protection 66 standard, which makes them ideal for high pressure wash-down environments. In aseptic pumping conditions, the peristaltic pumps are also ideal, as the sterilisable tube is the only contact part. The pumps minimise process validation needs, ensure total containment of fluids and the isolation of active cultures. The Vantage 5000 pump has touch screen technology and an intuitive operating system, which is easy to operate and offers a user-friendly operator’s menu structure with visible colour-coded on-screen status alerts and alarm indicators. The Vantage 3000 is a smaller unit and, therefore, smaller flow rates are obtainable, notes Van der Westhuizen. Verderflex recently installed a Vantage 3000 dispensing tube pump at Alliance Technical Laboratories (ATL) in Suffolk, England. At ATL, hygienic bags are filled with a sterile media for meat and other food packaging. The company regularly has to accurately dispense chemicals and other fluids. Previously, this was a labour-intensive manual task and prone to human error. Packo pumps, a brand represented by Verder Pumps, designs and builds cleaning systems that clean a complete production line based on the Cleaning-in-Place (CIP) principles: automatically without opening or dismantling process equipment such as tanks, pipes, heat exchangers, and filling and mixing machines. The fixed CIP system contains several tanks in which the cleaning liquids are brought to the correct temperature and concentration. The system is permanently attached to the process line and can clean multiple installations. The CIP Packo pump offers a hygienic pumping solution, designed to adhere to the strictest standards to reduce contamination risk. The CIP pump range also promise to increase productivity as it can be cleaned faster, offers a longer installation lifespan and lesser standstills. It is easy to move, connect and operate. “Verder Pumps SA offers the best cleaning and self-draining capability across its range of pumping solutions products,” Van der Westhuizen concludes.